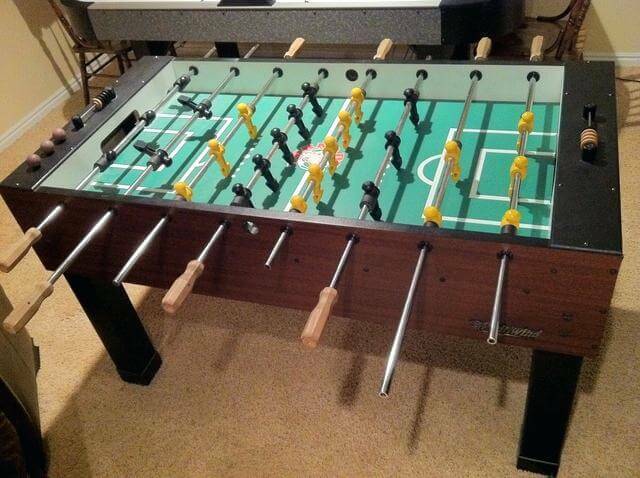 The Tornado Sport Foosball Table is our #3 pick for best overall foosball table. When the Tornado Sport table was launched, it replaced the Tornado Whirlwind, which was very popular at the time. Now, Tornado is THE leading manufacturer of American foosball tables, and is one of the top Foosball Table brands overall, which is popular for producing insanely high quality tables. The Tornado Sport is the best Tornado table for beginners. This means that it’s the cheapest option (though still quite expensive), but that it is missing some of the pro- or tournament-level features you’d want in an excellent table. For example, there are no counterweighted men (so expert players won’t be able to get an honest game in). However, the lack of features doesn’t affect the quality or quickness of the game otherwise. The Tornado Sport doesn’t have a flashy design like the Tornado Tournament 3000 Foosball table but it is very sturdy and is made of high-quality materials, like all Tornado’s offerings. It has a minimalist and clean design that looks attractive in any room. The cabinet walls are 1 inch thick and have Mahogany Melamine finish, which means it’s very sturdy and well built. You can see from the design and the color of the Foosball table that it is from Tornado. You can see two rectangular holes on two narrow sides of the cabinet, which means it has slightly annoying end-of-table ball retrieval. It has eight fairly thin 1/8 inch rods with miniature players attached to them and four poles on each side have Sure Grip plastic handles (pretty decent handles from Tornado). It has a green surface with black and yellow players that make the Foosball table visually attractive and give it a fairly classic look. The Sport Foosball table comes with a traditional 3-man goalie design and it has end ball return and not side ball return like other Tornado tables. It has height adjustable legs with boot levelers so that you can adjust the height of the table to ensure it’s level and has an even playing field. You should always make sure that you choose a table with thick table legs. It will not allow the tables to shake during the game play. It has hollow steel rods that are lightweight and help you play the game faster and in a comfortable manner. Beginners might find it difficult to adjust to the faster rods but once they learn, they will love to play with them. The rods and bearings in Sport version are same as those in Tornado Classic Foosball table, which means they’re very high quality. Tornado has improved the design of the player foot that comes with higher cross-hatching and square sides which helps in precisely controlling the ball. It has also got a new thinner inner bearing design that does not allow the ball to pass through the walls and the foosball men players. Also, Tornado balls are famous for being amazingly quick but also giving you incredible control with their slightly textured surface. 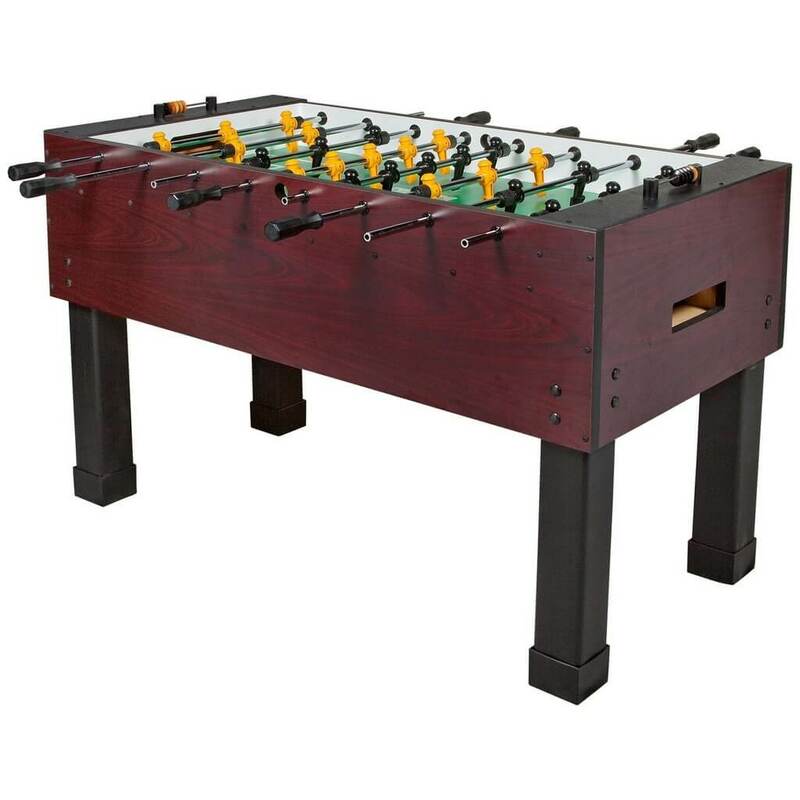 This high- quality table is one of the best foosball tables for quality gaming experiences. With the superior durability and design, the Sport version is a good option for training purposes as well as for recreational activities. The Tornado Sport Foosball table is made in the US by Valley Dynamo, which is popular for manufacturing the best foosball tables of the highest quality. The materials used in this table are of premium quality and thus it can withstand aggressive play for a longer period of time. The Sport foosball table is also suitable for people of various ages as the height of the table is slightly adjustable. You will find that the Sport foosball table is very easy to assemble with the help of instruction manual. The only drawback is the missing of counterbalanced players for easy game play but we cannot ignore all the features it provides for some excellent game play. At this price, Tornado Sport Foosball table is a good option as it is durable and has a very simple and sturdier design. Weighing at 205 pounds, this Foosball table will provide a very stable game play experience to the players. Because you still get Tornado quality, it was hard to put this any lower on the list. It is the cheapest table they offer, and while you miss out on some of the important features of other tables, you still learn how to play fast on a high end table.